The right and left rectus abdominis run parallel to each other and are separated by the linea alba. When people think of working out at the gym, chances are that they imagine doing planks, crunches, and sit-ups. Why? Core work is a central component of fitness because building strong abdominal muscles helps with balance and stabilizes the spine, improving posture and aiding in both sports activities and the simplest of everyday movements. If you’ve ever been sore after a tough workout, or if you’ve felt the pain of recovering from abdominal surgery, you’ll know just how active your abs are on a daily basis—it’s hard not to engage them. So let’s take a couple of minutes and talk about this “core” group of muscles! 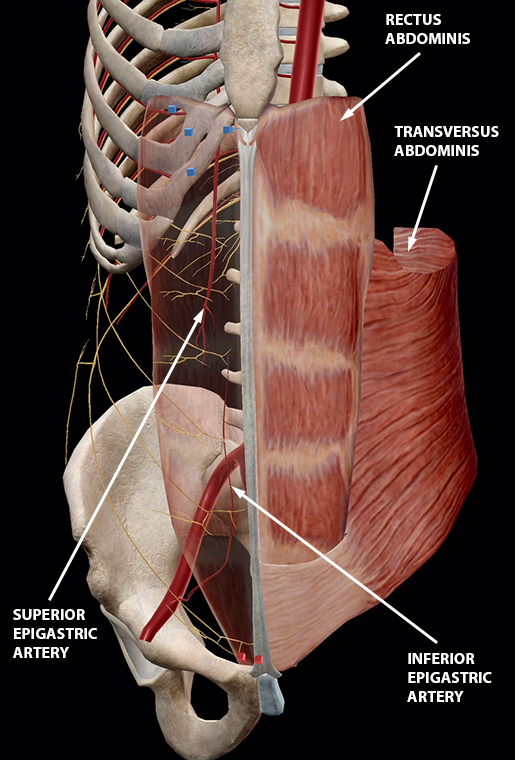 The transversus abdominis muscles are the deepest of the ab muscles, and their job is to tense the abdominal wall, compress abdominal viscera (the internal organs of the abdomen), and stabilize the pelvis and lumbar spine. One transversus abdominis muscle wraps around each side of the abdomen. See the “holes” towards the bottom of each transversus abdominis? 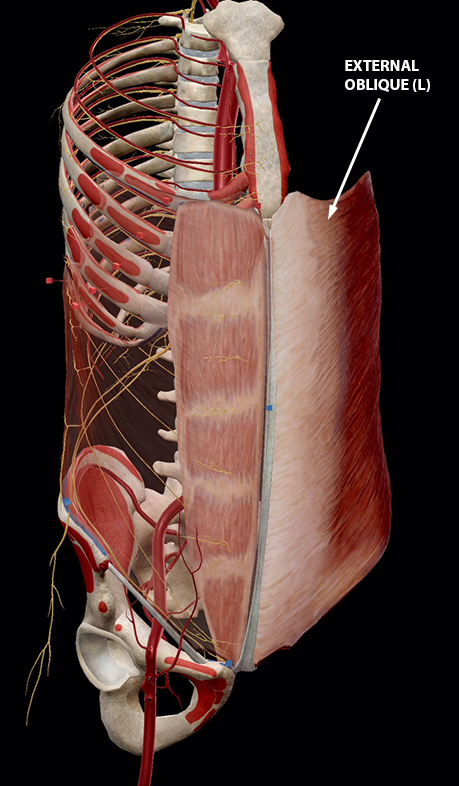 Each head of the rectus abdominis passes through one of them on its way from the pubis to the xiphoid process and ribs (you’ll see how in the next section). The rectus abdominis muscles are a pair of long muscles that run vertically up the front of the abdomen, stretching from the pubis to the xiphoid process. They compress the viscera and tense the abdominal wall. 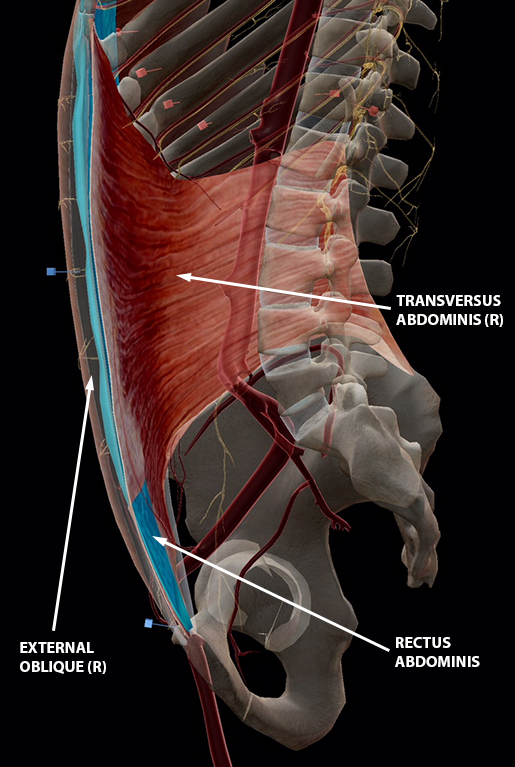 You’ll notice in the picture below that the lower part of the rectus abdominis rests underneath the transversus abdominis, and the upper part rests on top. As one of the primary movers in spine flexion, the rectus abdominis also helps to flex the vertebral column and bring the pelvis forward. The internal and external obliques are the other primary movers in spine flexion. Did you know that the rectus abdominis is responsible for the appearance of “six-pack” abs? 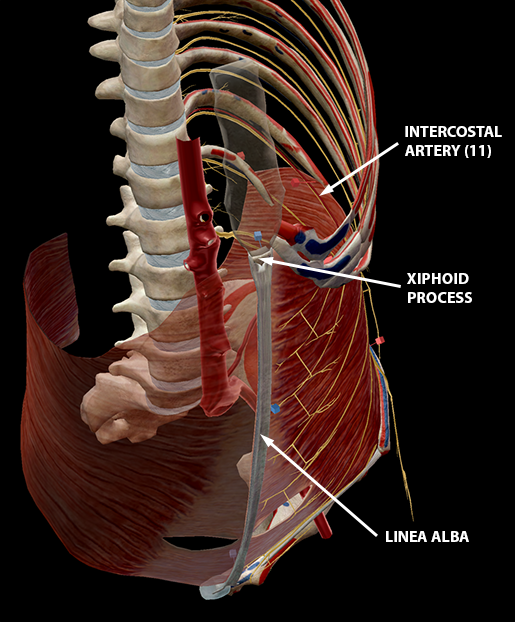 The linea alba vertically separates the right and left rectus abdominis muscles, and bands of tissue divide each one into distinct segments. The rectus abdominis is held within the rectus sheath, which is formed from the aponeuroses (sheets of connective tissue) of the transversus abdominis and the internal and external obliques. The internal obliques are located between the transversus abdominis and the external obliques. When both internal obliques work together, they join the other abdominal muscles in compressing the abdominal viscera. They also help with spinal flexion. When working individually, the internal oblique muscles are principal movers in the rotation and lateral flexion of the spine. Image and video footage from Muscle Premium. The external obliques are the outermost abdominal muscles. They are also key participants in spinal flexion and the compression of the viscera. Individually, they act alongside the internal obliques in lateral flexion and spinal rotation. The pyramidalis muscles are small muscles that sit in the lower abdominal wall within the rectus sheath. Some people have pyramidalis muscles on both sides, some only have one, and some don’t have any at all. 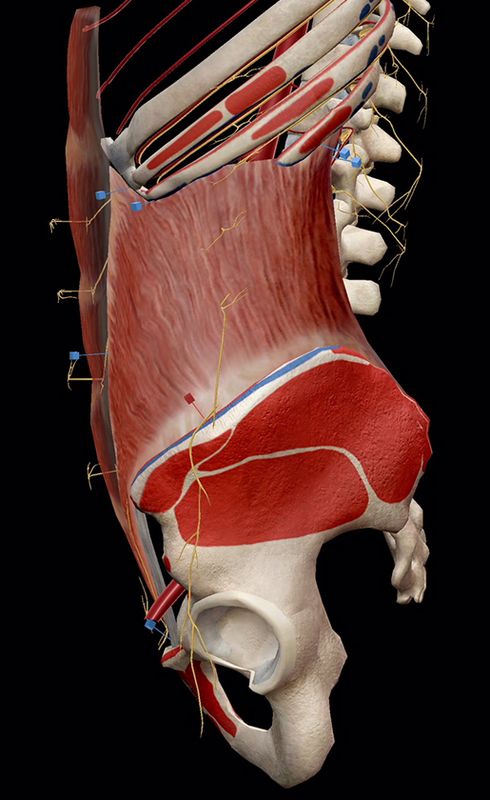 When present, the pyramidalis assists with abdominal cavity compression. So what’s the take-home message here? First, your abs are constantly doing a lot of work to stabilize your pelvis and regulate the pressure on your abdominal cavity. Each layer, from the transversus abdominis to the external obliques, has its own role to play in keeping you moving with good balance and posture. All in all, they make a pretty killer team. You might even say they’re fABulous.